The fourth (also to be the final) album of Stiff Little Fingers’ first incarnation, Now Then… was not as successful as their earlier albums. The album took the band towards a more pop/new wave-oriented sound than their previous releases and wasn’t received that well by fans and critics. Having sad that, it did reach No 24 in the UK album charts. In 1981, drummer Jim Reilly left, and was replaced by Dolphin Taylor (from the Tom Robinson band). “Looking back, for me, that was the end of the REAL SLF. After touring and recording for four years, Jake decided that 1982 would see the end of SLF. He wanted to pursue a solo career and walked away. I went back to a life in Belfast.” (Henry Cluney, from his website). 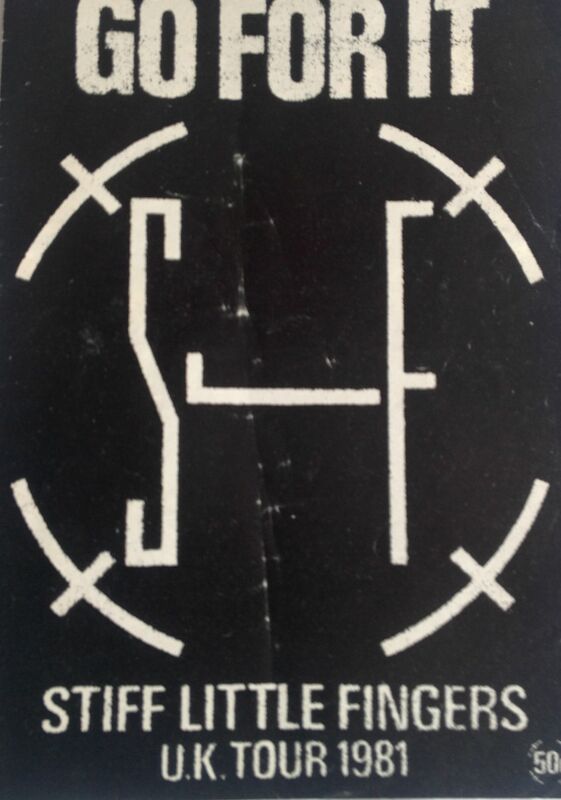 Frustratingly, my tickets and programmes for SLF in 1982 leave me confused once again. I have a ticket stub from a concert at the City Hall on 23rd January 1982, yet the programme from the same year shows that they played twice at Newcastle City Hall on 11th and 12th October 1982. So….was the January gig postponed until October? Or did I see them in January and October? And if I did, where is my ticket stub from the October gig? Who knows….I’ve giving up beating myself up about such things, and just accepted that my memory is not good these days. Perhaps if you read this you can help solve my dilemma. Support for some of the dates on the October tour came from Midnight Oil, an Australian rock band who hit the UK charts “Beds Are Burning” later in the ’80s. By 1983 it was all over. Stiff Little Fingers announced that they were to split, and played a few farewell gigs, one of which was at Newcastle City Hall. Support came from the mighty Alarm (68 Guns). Now I do remember this gig well. It was a storming concert, much better than their concert at the same venue previous year, and a fitting send off for a great band. There was a sense that this was the last time we were going to be seeing them, and we wanted to make sure that we made the most of it, and we also wanted to let the band know how much they meant to us. 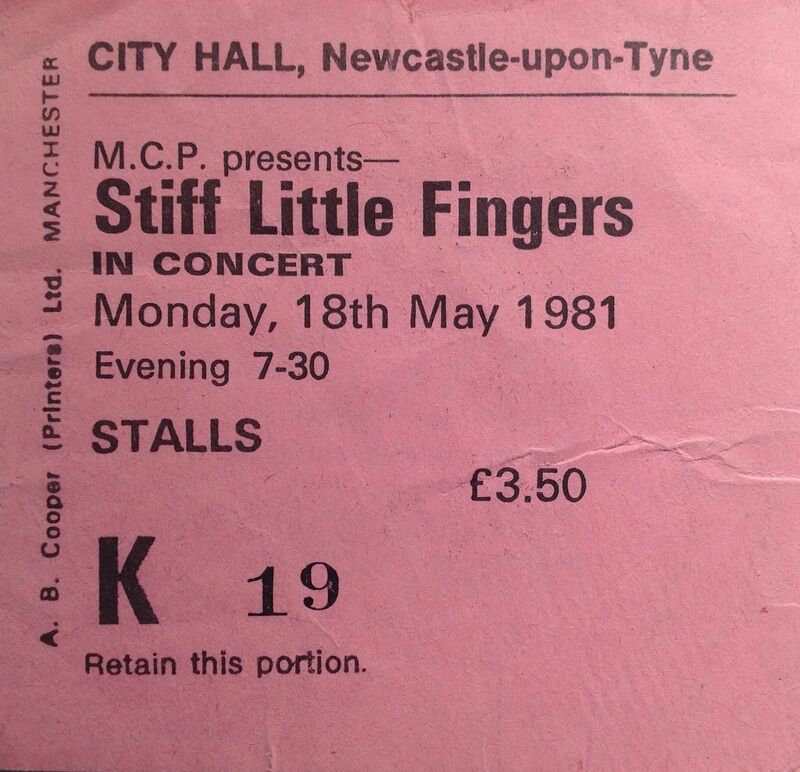 It was almost two years between Stiff Little Fingers gig at Newcastle Mayfair on 9th June 1979 during their Gotta Getaway Tour and their next appearance in the city which saw them playing Newcastle City Hall on 18th May 1981. There was a reason for this. SLF front man Jake Burns explained (Record Mirror, 1981): “We tried on ‘Go For It’ to be as straightforward as possible while remaining as clear about the world as we could. We ran into problems before for being too subtle because people don’t always see the humour in our songs. ‘White Noise’ on Inflammable Material got us banned from Newcastle for two years or so. A councillor read the lyrics and ordered that they couldn’t have bands spreading such racist ideas in Newcastle. 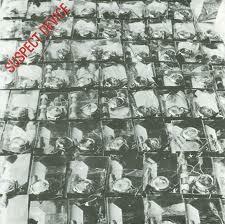 There was a headline, ‘PUNK ALBUM COULD START NORTH EAST RACE RIOT. 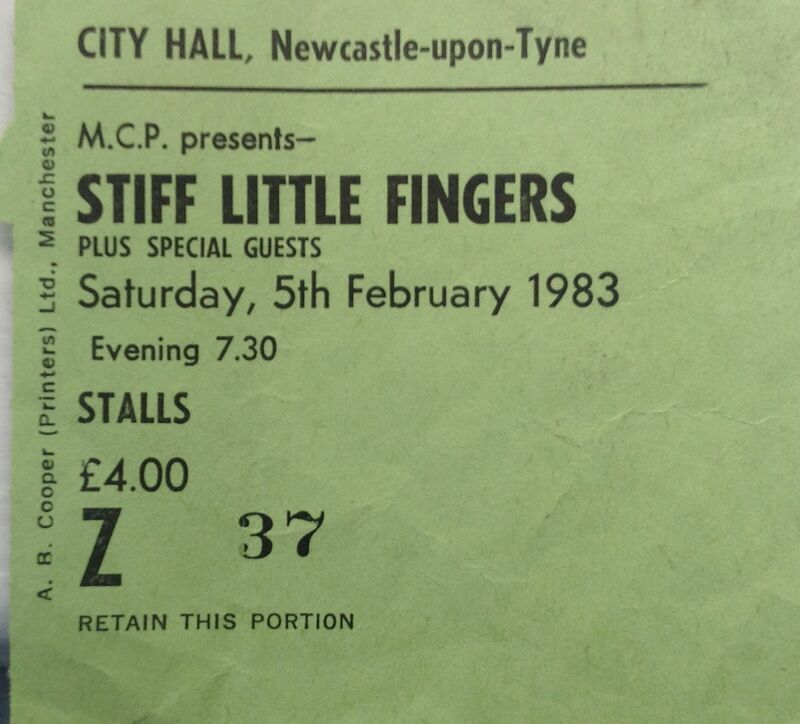 '” This misunderstanding stopped SLF from coming to Newcastle during 1980. However by the time they came to tour with “Go For It” things had relaxed and the band were able to book a concert at the City Hall, which quickly sold out. “Go For It” was SLF’s third album and saw the band’s style change a little, covering new subjects such as domestic abuse in the song “Hits and Misses” but also still retaining their stories of being a teenager growing up, with the song “Kicking Up a Racket”. Live, however, little had changed. Stiff Little Fingers remained a hot, passionate live act who really meant it, and had a massively loyal following in the north east. 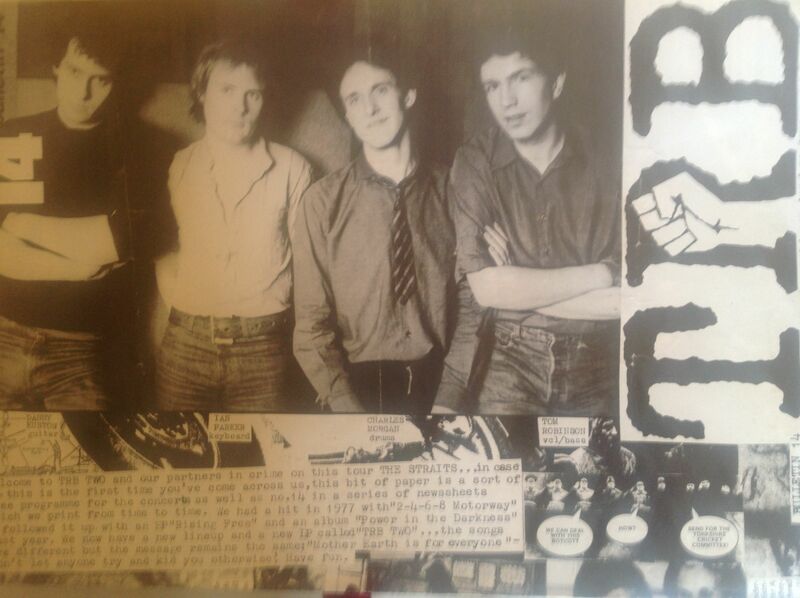 Support act for the tour was punk band The Wall, who originated from Sunderland. Another great gig by a great live act. My memories of this gig are sketchy, but what I do remember is that it was one of the wildest, craziest and most amazing concerts I have been to. 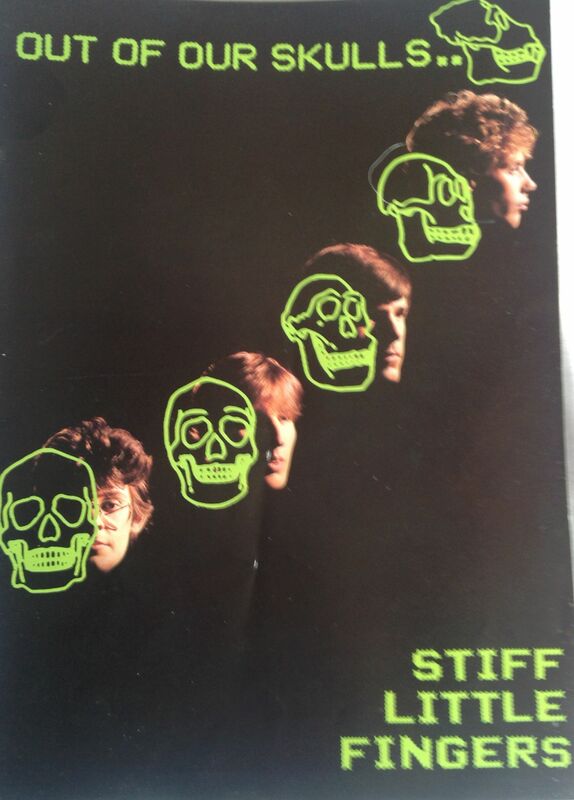 It was around the time that Stiff Little Fingers were just starting to break through and make a name for themselves. They’d had some success with the singles “Suspect Device” and “Alternative Ulster”, and had just released their first album “Inflammable Material”. I’d already seen them play as support for Tom Robinson at the City Hall in late 1978. What I do remember well was that the place was jam packed; dangerously so. They had somehow crammed so many people in there that you couldn’t move at all. And there were lots of fights. The Upstarts manager, Keith Bell, aka The Sheriff, kept jumping into the crowd and sorting out the trouble. Both bands put in awesome, high energy performances; Stiff Little Fingers were unbelievably good: raw, full of energy and passion. The place went completely crazy when they played those classic songs: “Suspect Device”, “Wasted Life”, “Barbed Wire Love” their great version of Bob Marley’s “Johnny Was”; and when they played “Alternative Ulster” the crowd was going entirely nuts. I didn’t think I was going to get out of the place alive. That night SLF were, without question, simply the best new rock’n’roll band on the planet. The atmosphere was a mix of danger and pure rock energy. My mate and I lurked near the back of the crowd, being two of the few people in the hall with long hair. Where did those days go? Was it really more than 35 years ago? 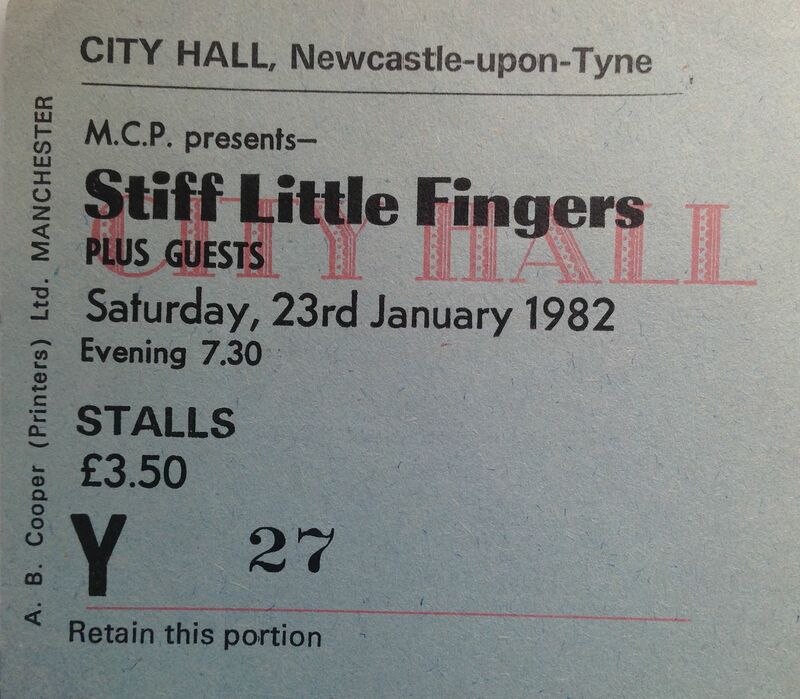 I saw Stiff Little Fingers again at Newcastle Mayfair in June 1979 (with support from the Starjets) and then at the City Hall a few times in the early 80s. They were always great but none of those gigs were as raw, energetic or exciting as that night at the Guildhall. I’ll write more about SLF tomorrow. 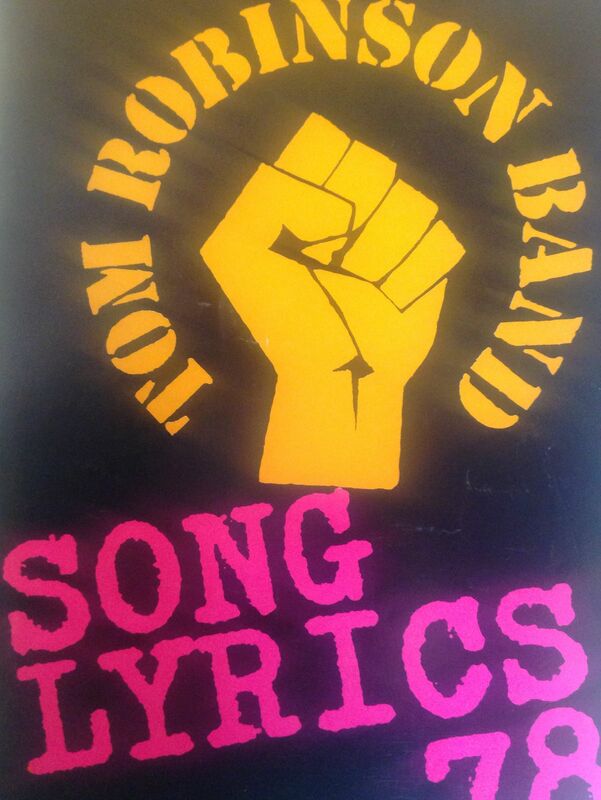 The Tom Robinson Band are often overlooked when the history of punk and new wave is written. That’s a shame, because they were one of the best live acts of the period, and their songs contained all of the necessary political messages of the time. I first saw them live in the early days, probably 1977, at Middlesbrough Rock Garden. It was probably only about half full, and the punks were very unsure as to how to take an openly gay singer, but managed some quite nervous singing along to “Glad to be Gay”. Tom Robinson must have had some nerve, it was quite a brave thing to do, to go out and sing that anthem in clubs packed with punk and skins, many of whom had strong right wing views. I was impressed by TRB that night, although it was the first time that I was seeing the band, and I hadn’t heard any of the songs before, it was obvious that they were strong pop songs, with political messages and great hooks. The first, and classic, Line-up of the band was Tom Robinson (vocals, bass), Danny Kustow (guitar), Mark Ambler (keyboards) and Dolphin Taylor (drums). The other band members were all an important part of the mix, particularly Danny Kustow; his guitar playing was excellent and his passion, energy and presence matched Tom’s. And they had a clutch of great tunes, many of which ended up on the first Tom Robinson album, which is one of the strongest debuts of the time. Most people remember the big hit single “2-4-6-8 Motorway”, but there were better tracks on the album including the call to arms: “Up Against the Wall” and “The Winter of ’79”, the simply excellent catchy “Long Hot Summer” and title track “Power in the Darkness”. The big live favourites were the sing-along chirpy ode to a big brother “Martin” (just listened to it on YouTube and it sounds as good as it ever did) and “Glad to be Gay” which seemed to be playing everywhere I went in 1977 and 1978. 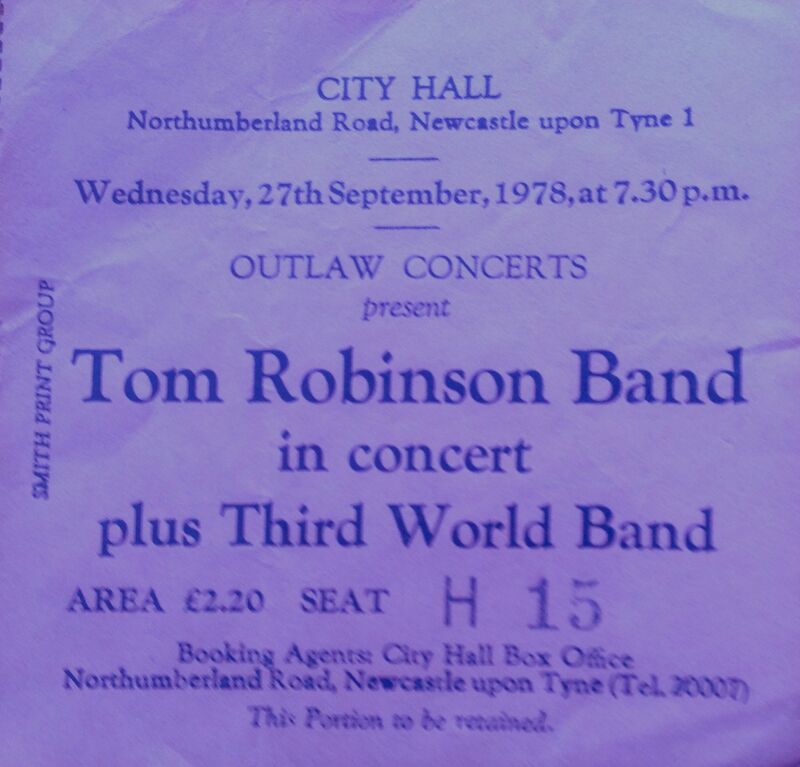 I saw the Tom Robinson band at a triumphant concert at Newcastle City Hall on 27th September 1978 and also at Reading festival 1978 and at Sunderland Mayfair on 28th March 1979. By the time of the Sunderland gig both Ambler and Dolphin had left the band, and things were never going to be the same. The Tom Robinson band split in 1979, shortly after the 1979 tour and the release of their second, and much less successful, album. Support at the City Hall gig was the excellent Stiff Little Fingers, not as the the ticket says reggae band Third World, and at Sunderland it was The Straits, an all-girl new wave band from Leeds.